Using iBike's new Generation III power measurement technology, Velocomp provides the next power measurement breakthrough with the iBike Sport, a straight-forward, easy-to-use power meter retailing for $199. 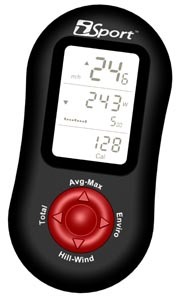 The new iBike Sport is a fitness-oriented power meter that uses the same power measurement technology as iBike's top-of-the line iAero to deliver full power meter functionality and advanced cycling computer functions with accuracy comparable to power meters costing thousands more. As an industry first, the iSport provides a built-in fitness test that lets riders assess their cycling fitness and monitor their progress over time. Users can jump-start their training and improve ride results with exclusive on-screen cardio, fat-burning, and strength-building workouts customized to their personal fitness level. "The iSport is the perfect tool for cyclists looking to improve their performance and fitness," says John Hamann of Velocomp, "The personalized fitness programs allow cyclists to train to meet their individual goal whether it's cardio, strength, or weight loss." The iSport requires no special equipment. It can be used with any wheel, hub, crank or chain. And there's no software to load or learn and no special equipment needed  JUST MOUNT AND GO! iSport comes with the iBike-exclusive publication, Fast Fitness with Power, by professional cyclist and coach Boyd Johnson with foreward from power training expert Hunter Allen. In straightforward terms Johnson shares essential information on how to use your iSport and reveals the secrets to reaching your cycling goals and getting the most out of every ride. "At an MSRP of $199 the iSport provides unrivaled value to the cyclist," notes Hamann. Ride data from the iSport is not downloadable; however, the iSport is fully upgradeable to an iBike Pro with all of its features and download functionality. The iSport is available for immediate shipment in theft-proof retail packaging.